Mark: Has he told you what he wants to be for Halloween? Mark: He wants to wear a red body suit and carry a machine gun and run around screaming. … that’s what’s in his head. Austin: [From upstairs, screams like a banshee and hits the bed, again – but thank god it’s not the wall – with a light-up sword that only makes the fun noise when it hits something hard. Mark [ominously]: How scary is that? Happy fall! Time to shop for Halloween costumes, have another slice of salted caramel pumpkin cheesecake, and laugh at the holes in the walls. Whisk together granulated sugar and water in a medium saucepan and cook over medium-low heat until sugar is dissolved. Add butter and bring to a slow boil. Continue to cook over medium heat until sugar turns a deep copper brown. Remove from heat and slowly add heavy cream. Set aside to cool. 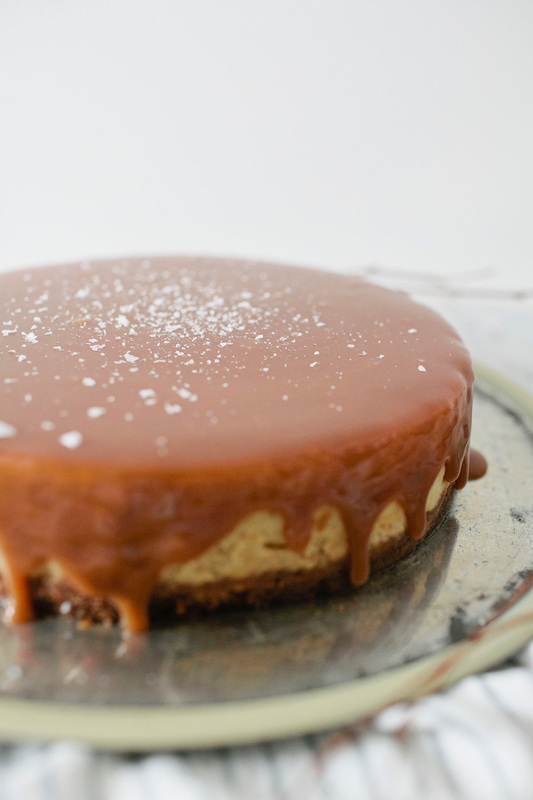 Before serving, whisk caramel together with rum and vanilla and pour over cheesecake. Position rack in center of oven and preheat to 350°F. Wrap a double layer of aluminum foil around outside of 10-inch-diameter springform pan. Combine graham crackers, sugar, cinnamon, and melted butter in a food processor until graham crackers are finely ground and crumbs begin to stick together. Press crumbs onto the bottom of the springform pan. Do not go up the sides. Bake until crust is slightly golden, about 10 minutes. Transfer to rack and cool. Make sure all ingredients are at room temperature before combining. Maintain oven temperature at 350°F. Using electric mixer, beat cream cheese and sugar in a large bowl until smooth. Beat in eggs 1 at a time, then add pumpkin and remaining 7 ingredients, being careful to beat only just until blended. Pour filling into prepared crust and place springform pan in large roasting pan. Add water to roasting pan to cover springform halfway. Bake cheesecake until slightly puffed and softly set and top is golden, about 1 1/2 hours (This took only about an hour for me, so watch closely, but be careful to open the oven door as little as possible). When cheesecake has set (it should still jiggle a little in the middle, but be firm) transfer springform pan to rack and cool. Cover and refrigerate cake overnight. Using knife, cut around sides of pan to loosen cake. Release pan sides. Yes Austin told me about his costume… Like Mark said… How scary is that? OMG…. Does this look good! Well, this looks absolutely DIVINE. Oh my goodness do we all need a slice of that right now! LOL toy makers are such sadists! 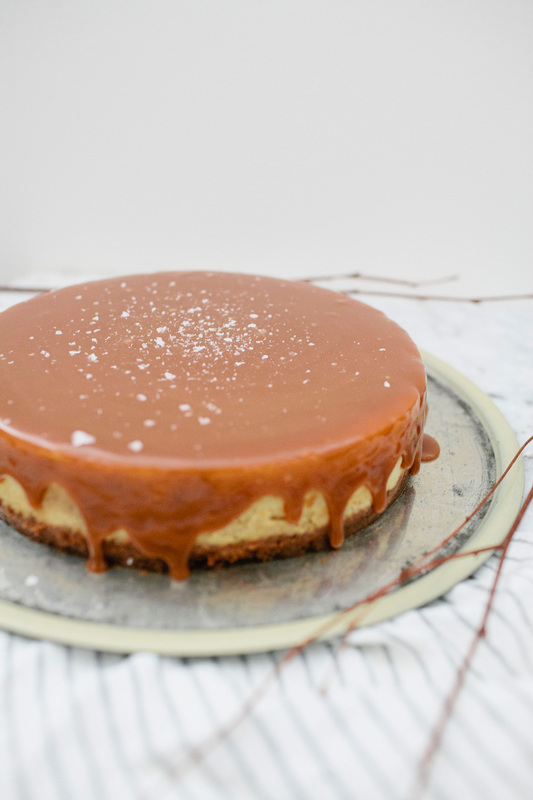 This cheesecake looks delectable – give me salted caramel everything! Laughed so hard at the little anecdote hahah, adorable family! and wow wow wow that looks like one amaaazing cake! This sounds absolutely, positively divine! Omg, this looks so scrumptious!! Cheesecake is my favorite dessert!! 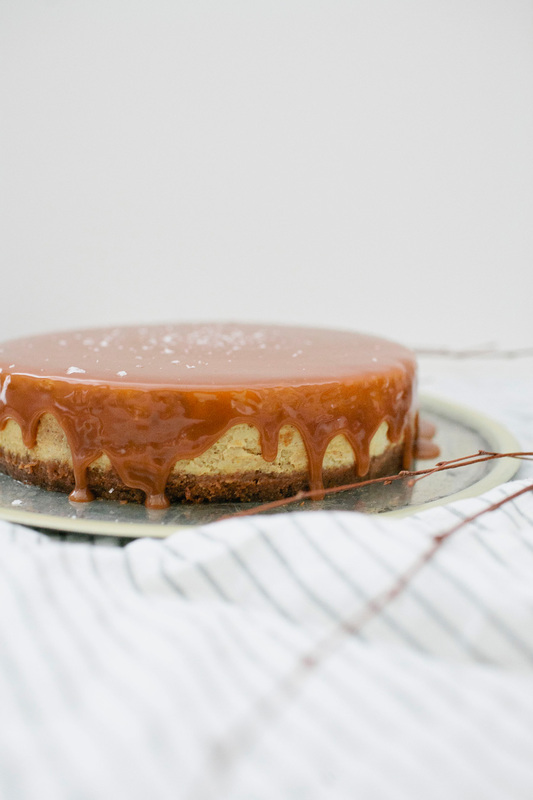 oh this cheesecake looks amazing! I don’t have vanilla rum…can I use just dark rum? Yes, definitely! Hope you love the recipe! When do you put the salt in? Also, what kind of salt? Thanks!! Oh sorry Celia, good catch! I’ll edit to make that more clear. I added the salt at the very end, just to the top of the cheesecake. And I used maldon salt for a nice finish (so you can see it on top). I found that was plenty without adding directly to the caramel, but if you’d like it a little saltier you can do that as well. 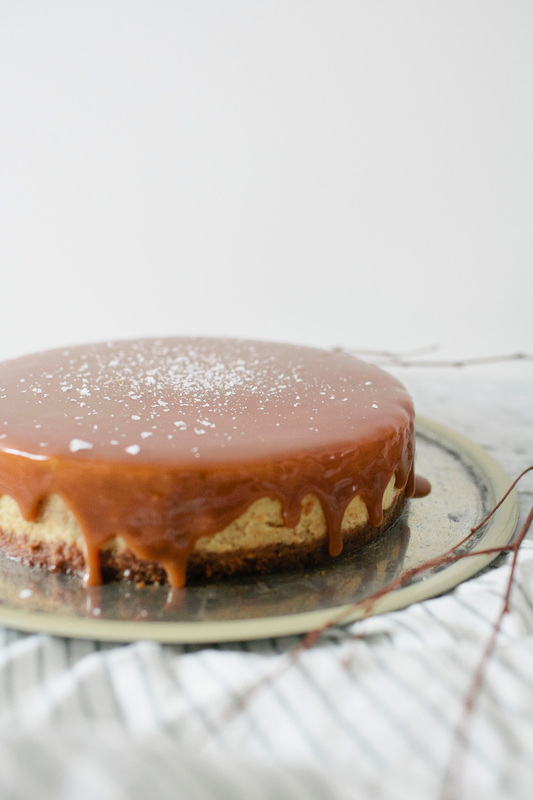 This is such a gorgeous cheesecake!